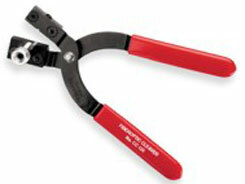 Designed for use with mechanical splices, the newer "No Polish Connectors" and any other cleaves which require precise cleave lengths. For use on glass fibers with 125 um nominal cladding diameters. Glass fibers with 125 um nominal cladding diameters. Accomodates fibers in coated as well as cable form. Steel handles with vinyl grips. Replaceable carbide blade designed to yield up to 5,000 consistent cleaves. Cleave length adjustable from 6.5 mm to 20 mm. Cleave angle <1/2degree 50% of all cleaves, <1degree 85% of all cleaves, <2degree 100% of all cleaves.